An Introduction to Palliative Care. 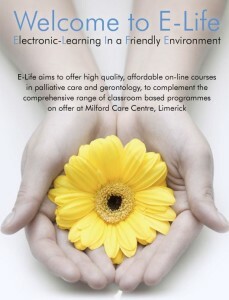 An accredited online interactive 1.5 hour programme developed by Milford Care Centre, in conjunction with the All Ireland Institute of Hospice and Palliative Care. Formal Family Meetings: A Structured Approach to Communication in Palliative Care. An accredited online interactive 4 hour programme developed by Milford Care Centre and Marymount University Hospital and Hospice, in conjunction with the All Ireland Institute of Hospice and Palliative Care. Intravenous Medication Administration for Registered Nurses, a Blended Learning Programme. This blended learning programme allows the Registered Nurse to complete the theoretical component of this programme online. On successful completion of the 2 hour online session candidates can print a certificate. The candidate must bring the certificate to the practical workshop. Participants will be able to attend Milford Care Centre for approximately 2.5 hours to complete the practical components of intravenous drug administration. Select the course. You will be asked to log in or create a new account if you have not done so already.